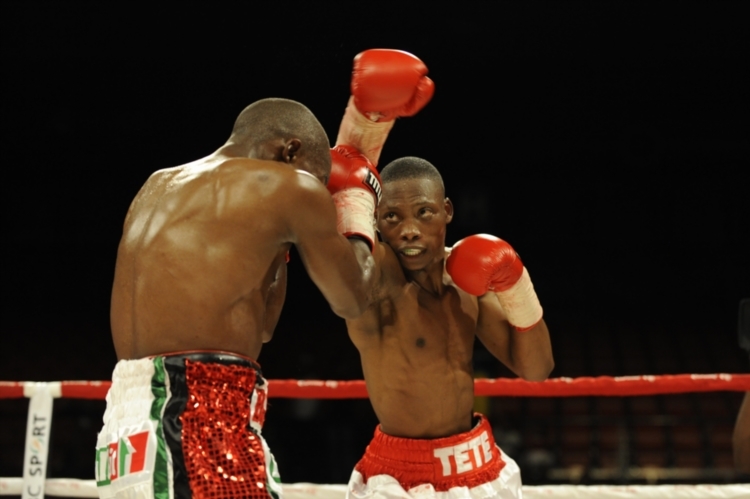 FILE PICTURE: Moruti Mthalane (red/white) and Zolani Tete (white/green/red) during the IBF World Flyweight Championship fight between Moruti Mthalane and Zolani Tete at Carnival City Casino on September 01, 2010 in Johannesburg, South Africa. Picture: Lefty Shivambu / Gallo Images. Just days after clinching an IBF junior bantamweight title fight in Japan against Teiru Kinoshita, nuggety Mdantsane boxer Zolani Tete on Monday received a further boost with the announcement he would be sharing the organisation’s Fight of the Year award. Tete earned the award from his successful junior bantamweight title eliminator against Mexican Juan Carlos Sanchez and gained the nod ahead of fights involving notable IBF heavyweight title holder Wladimir Klitschko, veteran Bernard Hopkins and super middleweight Carl Froch. The Tete-Sanchez fight was highlighted by an endless number of twists and turns, with both boxers taking turns on the canvas and gaining an ascendancy and losing it in turn. Tete initially floored Sanchez, a former IBF title holder, in a bloodied fifth round. Sanchez spat out his mouth guard in the process of the beating he was receiving, resulting in him being deducted a point. But the durable Mexican rallied to put Tete on his back in the eighth round, resulting in him clinching for dear life as he staggered back to his feet — resulting in him being deducted a point for excessive holding. The 25-year-old Tete turned on the heat once more in the 10th round when he mercilessly battered Sanchez all around the ring, resulting in the referee stopping the fight to put a halt to the assault. Milenkovic said it is the first time a South African boxer has won the Fight of the Year award from the reputable IBF. Tete’s manager, Mla Tengimfene, said the award could not have come at a better time as they were already involved in preparing for the title fight against Kinoshita on July 18. The Fight of the Year award ceremony will be held during the IBF’s 31st Annual Convention at Resorts Casino Hotel in Atlantic City, New Jersey on May 21. Klitschko, Hopkins and Froch are expected to attend to receive various other IBF awards. But Milenkovic said it was doubtful Tete would be present at the ceremony as he is well into his preparation for the Kinoshita fight and was loathe to upset the routine. “Winning the IBF title is now paramount in Tete’s mind,” added Milenkovic.